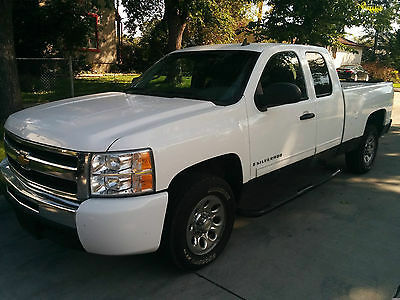 Real clean Avalanche LTZ 4X4. It is loaded with all options including navigation, Back up Camera, Rain sensing wipers, Don't let the mileage detour you as this truck runs and drives like new. Has always been babied and had 100% synthetic oil changes every 3,000 miles. I beleave it is all original paint and shines like new. Has some small minor imperfections and a couple chips. It has the factory air ride suspension and I have just replaced the air compressor and the rear electronic air shocks. I have also just replace all 4 brake pads & rotors with up graded rotors that are drilled and slotted for better cooling. It has a towing package and and a electronic brake controller.Other extras include a custom stainless grill, Gibson dual exhaust, after market cold air intake. Interior is very clean and in super condition. It has a DVD player to watch movies in the back seat. Everything works as it should. I have a clean title for Canada and imported US title. I might be able to help with delivery and or shipping. 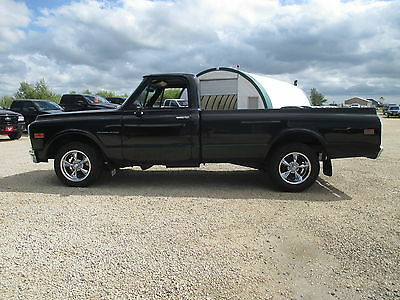 I reserve the right to end this auction early as I have this truck for sale locally. 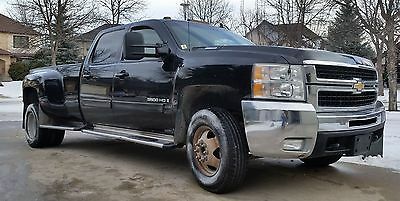 Retro 2006 Chevrolet HHR LTThis is the first year of production for the HHR!A collectors item in the near future!Designed after the 1949 Chevrolet Suburban.Very low kilometers!!!!! Approx. 63,490!!!!!(approx. 45,000 miles)I drive it everyday so that number will change.Super shiny metallic silver finish! you'll need your sunglasses to look at this one! (27 coats of wax...and counting! )This car is heavily optioned, some of which include, slider sun/moon roof, PW, PDL, power drivers seat, cruise control, 17" highly polished wheels, chrome package(Grill, mirrors, door handles, 3" exhaust tip and roof racks), tinted windows, remote mirrors, rear spoiler, A/C, dual remote mirrors, dual vanity mirrors, 3 cup holders, heated seats, compass, thermometer, delay wipers, tachometer(7,000 RPM), multiple storage areas, map lights, etc., etc., etc. !This HHR is not your everyday "seen one, seen them all car" it is unique and admired by many and is quite the conversation piece!Platinum Pennzoil synthetic oil is used.Fully undercoated!This car has been well maintained. 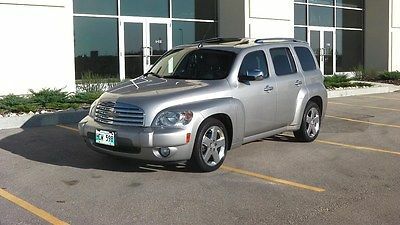 (Have all receipts)It drives and handles very well!The 4cyl. 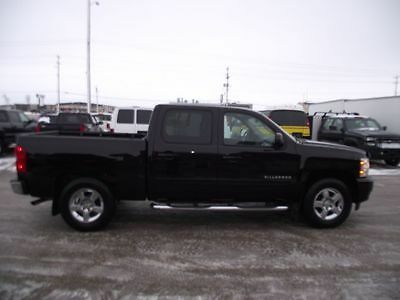 engine has the get up and go when you need it as well as good fuel economy!The interior features gray leather. (buckets and console), leather wrapped steering wheel, rear seats also fold down for loading larger cargo. (Lot's of room!) You don't need to rent a U-Haul to bring that large dresser home!Nice multi-speaker CD system.Non smoker, no pets.Comes with owners manuals and original showroom brochure.This car is not perfect(It is a daily driver), minor dings, scratches, etc. Nothing major! But, it really stands out in any crowd!It would be hard to find a nicer HHR anywhere!!!!! !If you fly in I will pick you up at the airport and you can drive it home!Let's talk! 1991 Chevrolet Corvette Convertible 5.7L V8 Automatic. Fully loaded with air cruise tilt Power windows locks mirrors seats. Great condition inside and out. Runs and drives like new. Clear title local car with no major accidents as per carproof. Only 122,000kms(75,800 miles). Pride of ownership is evident. Meticulously maintained. 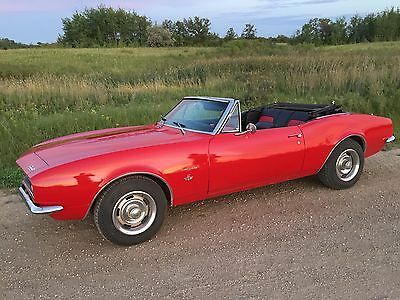 Great summer cruiser with the top down. Comes with newer rubber, Brand new safety! Seller reserves the right to end auction early due to vehicle being listed locally. Call Craig at 204-831-7040 with any questions. 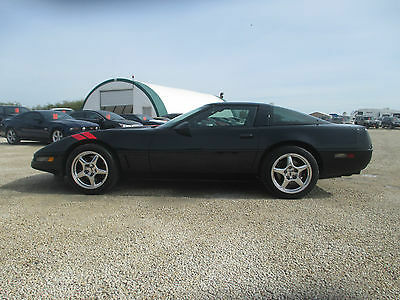 1996 Chevrolet Corvette LT1 (350) Automatic. Fully loaded with air cruise tilt Power windows locks mirrors seats. Removable Roof. Rare color combo with matching black & red leather interior. Absolutley mint condition inside and out. Runs and drives like brand new. Guaranteed none nicer. Only 34,500 Miles (52,000kms). GrandSport appearance package. Clear title accident free car as per carproof. Guaranteed no dissapointments and must see and drive to believe the condition. Comes with newer rubber, Brand new Mb safety. Safetied vehicle, with 138 800 kms, or roughly 85000 miles. This vehicle drives well, and has sufficient tread on its tires, and good brakes. The vehicle has met all the recall requirements in Canada. There are some small rock chips on the front of the hood, it has a rip on the seam of the drivers seat, i.e. why doesn't GM actually put normal cloth on their seat that lasts at least over 100,000 miles?. It also has a two small dings on the back tailgate. This is sold by a dealer. I own Mactar Auto Parts and Salvage in Manitoba, Canada. In Winnipeg, we charge 5% Goods and Services Tax and 8% Provincial Sales Tax. Being an out of country buyer, I believe you get a credit on any taxes you may pay. The motor in this vehicle is a 4.8 litre, V8 with tow package. It has power windows, doors, cruise control, am/fm radio, air conditioning, and Sirius radio, Onstar capability. Please contact TJ at 204-294-0925. Carfax is available, shows no collissions, although there was a vandalism claim for $1700. 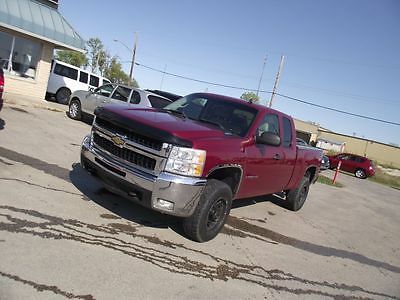 Buyer would be responsible for bringing it to the United States, the vehicle is currently in Winnipeg, Manitoba. 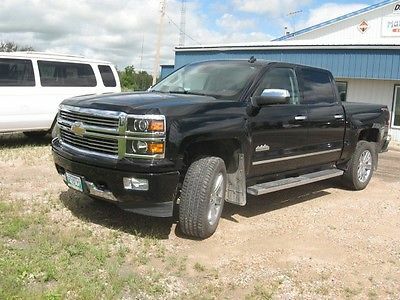 I am happy to meet someone in Morris, Manitoba to view this vehicle. This is a rear wheel drive vehicle. 2007 Corvette Coupe 6.0L 16 valve 400hp V8 engine with 400ft-lbs of torque. 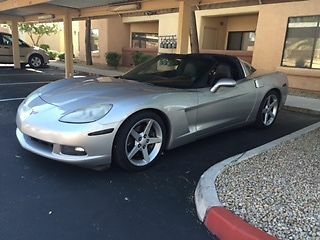 Las vegas car very well maintained 125000miles. This car is in great shape inside and out new rear tires. Very sharp body lines it truly is a must see. 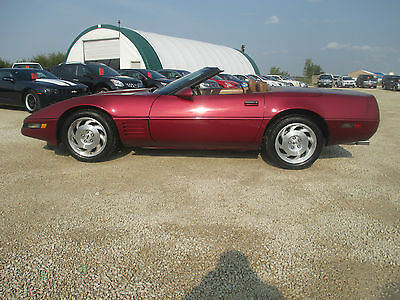 Call 204-783-1774 to view this vette. 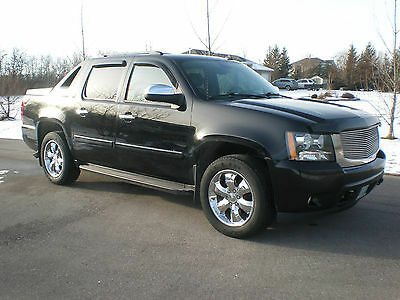 This vehicle is in amazing shape inside and out freshly detailed, it really is a must see item. Trades welcome! Onsite Financing available! Leasing available! Warranties Available! Pacific Motors 5275 Portage ave Headingley, Manitoba just 10 minutes west of Winnipeg on the #1 Hwy. To set up a test drive call 204-783-1774 or email sales at pacific@mts.net. Family owned an operated since 1981. 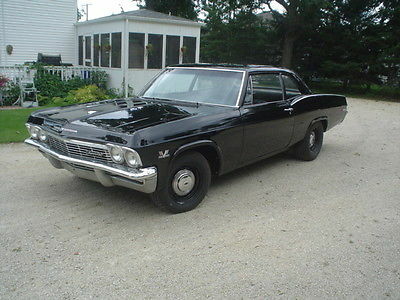 1965 Biscayne 2 dr Post Sedan "Big Block Black Biscayne" 396 / 325 hp rebuilt - all cast & date correct for 65 Fresh "Old school" single stage paint (the original color - Black ) 12 bolt posi - rebuilt with 3:31 gears F41 Heavy duty suspension ( 15/16" OEM F&R sway bars) Muncie 4 spd M20 trans with correct 65 Hurst shifter ( rare) Factory Vacuum Gauge Vintage Sun Tac This is a real 15411 Black post sedan... and as plain as they come . This car , when found , still had its original black paint and turquoise interior( but sunbaked). No other options... No PS , PB , radio , no rear seat belts , and no drivers door mirror ( as these were all options in 65) Solid Body , Frame and Floors .The under carraige is freshly detailed with new suspension , new brakes and new brake lines installed . New gas line and tank. New radiator installed Previously Rebuilt 65 396 ( all cast & date correct, as this powertrain was removed from a #'s matching 65 4 spd - 4 dr Impala found in Texas.) M20 Muncie 4 speed transmission ( from same 65 donor car as the engine) Hurst 4 spd Shifter ( correct for 65 ... and big $$ - rare ) . 12 bolt posi was rebuilt with 3:31 gears for better gas mileage . F41 HD suspension ( HD OEM F&R sway bars) Custom interior - seats and door panels ( dark gray with red piping... very sharp) . New Black carpet . Many NOS parts were used in this build. Correct 65 Biscayne steering wheel with NOS horn ring and NOS Hub will be incuded ( wheel is currently at shop being restored) Driver F&R bumpers ( some dents and discoloration) , and nice driver quality front grill. 15 " steel wheels with correct 65 dog dish caps . Good Glass all around . This car was built to be my daily driver , and not a trailer queen . Runs and drives beautifully . Nice solid shifts . Project is 90- 95% finished .... and still requires : Headliner , Trunk lid seal , Exhaust pipes & mufflers , wheel alignment , door channel fuzzies. The custom interior door panels and garnish mldgs (which are included) just need to be installed . There will be some finishing touches required ( wiring , light bulbs etc...). That's about it ! These Biscayne 2 door sedans are very desirable today , and are commanding prices in the $ 30 - 40 K range , so you will still be on the upside when these finishing touches are done ! Reason for selling ?.... too many 90% finished projects . 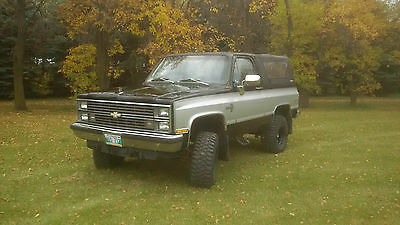 ( and need funds to complete the others ) Vehicle is located just south of Winnipeg , Manitoba , Canada . ( one hour north of the North Dakota US border.) I will assist the purchaser in loading, but it is the responsibility of the purchaser to arrange shipping , and pay any taxes , custom / import duties etc.. I can recommend one shipping company that a few friends have used with great results . This family run transport company that goes south to the USA to pick up cargo trailers to bring up to Canada . They usually go south empty and are always looking for freight to keep their costs down. UC Trailers ( talk to Maurice) http://www.uctrailers.ca Please examine the photos carefully as they are a big part of the description and ask any questions before placing a bid. A deposit of $500.00 via paypal is due within 24 hours of auction close . Balance of funds due with Certified Bank funds within 7 days . Vehicle will not leave my possession until all funds clear. If you have any questions , please ask or call 204.883.2542 . 67 Camaro convertible 327. Excellent driver. Family owned for the last 30 years. Stored indoor each winter. Power steering, power brakes, power soft top, newer quarter panels, fenders, rockers, floor panels-except for trunk. All seals in engine redone plus much more!! A true rare collectors item and a real head turner. No trades. $21,000 OBO. A rare vehicle to be enjoyed for years to come! 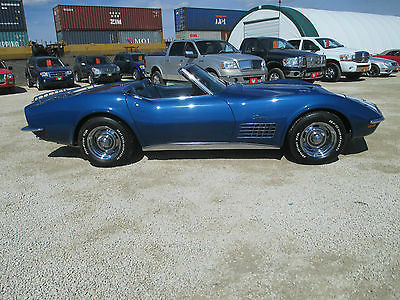 Rare Find 1971 Corvette Convertible 350cuin 330HP 4speed Muncie. This is a 2nd owner family car from just outside of San Francisco, California. Immaculate condition inside and out. 83,000 original Miles. Brand new Top, and interior just installed. (Not a factory LT1 as it was born as a 270HP) Newer factory color paint Bridgehampton Blue. All new interior, New Top, Serpentine kit on motor. Headlights, & Wiper door work as they should. All gauges operate. Too much to list. Must see to believe condition. Please only serious inquiries. Brand new MB safety. Can come with New Foose chrome wheels. 1500 miles on freshly rebuilt motor. Appraisal from 2013 done before new top, new interior and paint was completed. Loads of documentation available as far back as 1982. Lots of time and money invested. No disappointments, car runs and drives as good as it looks. Feel free to fly in and drive it home or have it shipped. Video of car running is also available upon request. Car is currently located in Winnipeg Manitoba Canada!! Call Craig @ 204 831 7040 to view indoors on this rare piece of american history!! Car is for sale locally and seller reserves the right to end listing early. Restored 1971 Chevrolet C-10 Reg Cab 8ft Box (402) 396cuin 425HP Big Block Automatic. Painted in Tuxedo Black. Frame on Restoratiton will all new parts. No expense spared. Line-X Box Runs and drives great. Local Mb truck. Comes with Brand new wheels tires,All new chrome, new interior, new front end. Rebuilt 396 with reciepts and much more. Rare find. Call Craig to view by appointment at 204 831 7040 Car is also for sale locally and we reserve the right to end auction early.